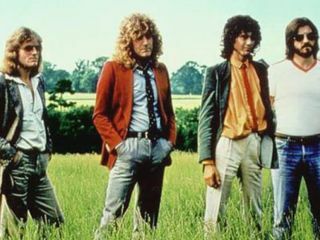 His business e-mails could "fill a book"
Singer Robert Plant insists he hasn't ruled out another Led Zeppelin reunion. Turns out he just hates paperwork, that's all. Apparently, there's a lot of it attached to anything Zep-related, and it's this kind of bureaucracy that puts him off the idea. Since Led Zeppelin's historic one-off gig at London's O2 arena last year - the band's first concert in 19 years - they have been hounded by rumours of a world tour. All of which makes Plant, still on tour with bluegrass star Alison Krauss (whose legal documents must be written on Post-It notes), skittish about hitting the road. Just for the O2 show, Plant says, "The endless paperwork was like nothing I've experienced before. I've kept every one of the emails that were exchanged before the concert and I'm thinking of compiling them for a book, which I feel sure would be hailed as a sort of literary version of Spinal Tap." In must will come as a harsh slap to millions of Zeppelin fans, Plant adds: "Led Zeppelin's never been about the fans. We've always been about four guys coming together to make thrilling, disturbing rock 'n' roll. On our own terms." Coming together on your own terms? Avoiding paperwork? Hmmm, seems like Plant could use a lawyer. You'd think he could afford one.